Customer experience management (CEM) programs can generate a lot of data. The value of these data is based on their utility to improve the customer experience and the overall quality of the customer relationship. Companies, to be successful need to effectively organize and analyze these large data sets as well as disseminate resulting information to the employees (from senior management to front-line employees) who need insights to deliver a better customer experience. Understanding, aggregating and analyzing customer feedback data starts with a business model. Because of the nature of the data is customer-related, this business model needs to be customer-centric. This business model will help guide data analysis and will, ultimately, lead to business decisions that are customer-centric. The Service Delivery Model, based on researchers at Harvard Business School, illustrates how customer experience programs can help the company to manage its customer relationships throughout their lifecycle (See Figure 1). Supported by empirical research, the model states that profitability and growth are stimulated primarily by customer loyalty. Loyalty is a direct result of customer satisfaction, and satisfaction is largely influenced by the value of services provided to customers. Value is created by satisfied, loyal, and productive employees. Employee satisfaction, in turn, results primarily from high-quality support services and policies that enable employees to deliver results to customers. Partners also provide products and services to joint customers and help to impact customer loyalty to the partnering company. The quality of the three relationships (customer, employee, and partner) impacts company financial success and the key to business success is managing these three key relationships. The key, then, to business success is to increase customer loyalty. 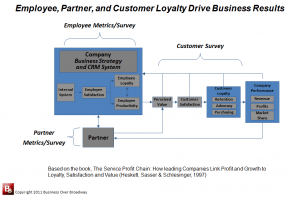 Companies can take two general approaches to improve customer loyalty. These are: 1) Micro or Individual Approach and 2) Macro or Organizational Approach. The micro approach examines the customer relationship for a specific customer. In this approach, the organization identifies customers who are disloyal (through their feedback) and intervenes to address the specific customer’s concerns. This approach addresses special causes of disloyalty (those that fall outside of normal variations) and reflects a short-term solution to customer concerns. Rather than focusing on improving the business process that resulted in this customer to become at-risk, the company’s main goal is address this at-risk customer’s concerns. Generally, improvements are targeted at disloyal customers to immediately address their specific needs. In this approach, timely handling of unhappy, disloyal customers is key to ensuring their attitudes regarding the company do not ultimately result in disloyal behaviors (e.g., defection, discontinue buying). Web-based data collection methods (social media, surveys) are an important ingredient in the micro approach to handling disloyal customers. These web-based feedback channels utilize the power of the Internet to automatically notify key personnel regarding the specific customer’s negative response(s). Trigger emails as well as twitter feeds are used to alert employees of unhappy, disloyal customers as soon as the customer submits his or her feedback. The macro approach examines the customer relationship across all the customers (or large customer segment) in which data are analyzed as a whole. In doing so, companies attempt to identify systemic reasons causing loyalty/disloyalty. As such, the macro approach to customer experience management addresses common causes of disloyalty and focuses on improving systemic issues responsible for the disloyalty. 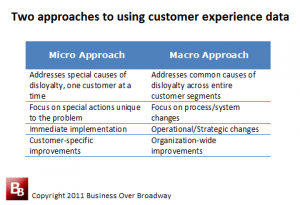 Unlike the micro approach to customer experience management that focuses on a resolving a specific customer’s unique concerns, the macro approach reflects organizational improvements targeted across a large group of customers (or, at least, large customer segments) and are aimed at improving systemic problems. Systemic changes to business processes are designed to have a long-term impact on customer loyalty. The Macro or Organizational approach begins with summarizing large sets of data; the goal of summarizing data is to draw general conclusions across a large segment of customers. There are various statistical methods of summarizing large sets of data, each method used to different purposes. 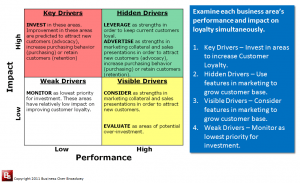 A key analytical method used for loyalty management is referred to as “loyalty driver analysis.” Loyalty driver analysis (see Figure 2) uses statistical analysis methods (e.g. correlational, regression) that are useful in summarizing large datasets. This method essentially identifies business areas (e.g., product, service, account management) that, when improved, would have a substantial impact on increasing customer loyalty. I will flesh out this method more in next week’s post. Table 1 summarizes the features of each approach. The micro (individual) approach addresses special causes of customer loyalty and focuses on changing individual customer concerns with customer-specific improvements that are short-term solutions to improving customer loyalty. The macro (organizational) approach addresses common causes of loyalty and focuses on improving systemic issues with organization-wide improvements that are long-term solutions to improving customer loyalty. The two approaches should not be viewed as competing types data use. Companies, to effectively improve the customer experience, need to address specific customer complaints while addressing systemic reasons for dissatisfaction/disloyalty.